After making quick work of the Rebels in Round 1, the Raiders now hope to replicate their regular season success versus the Blades, in which they won six of eight meetups. 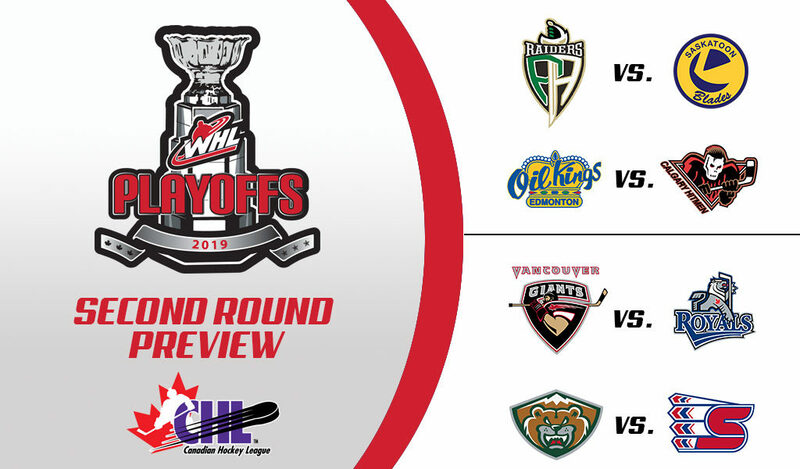 The Saskatchewan rivals kick off their second-round series Friday in what is sure to be the first in a tightly contested affair from two of the WHL’s top defensive squads. 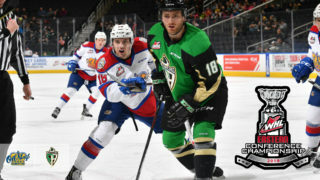 Neither is short on offense either, as the Raiders brought a balanced attack through the quarter-final that saw six players wrap up the series with multiple goals, including right-wing Brett Leason, a 2019 NHL Draft hopeful who came up with two goals and one assist. Meanwhile, right-wing Max Gerlach pushed the pace for the Blades, as he finished the opening round with five goals, registering a tally in each contest of the four-game ousting of the Warriors. Draft-eligible centre Kirby Dach also impressed through the first round, equalling Gerlach with five points to sit atop the Blades in playoff scoring. A series win for Saskatoon would mark the franchise’s first trip to the conference final since 1994, while the Raiders last advanced in 2005. 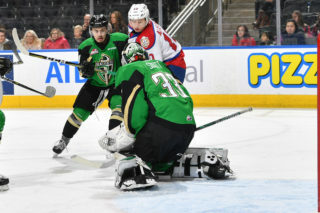 The Oil Kings went unbeaten in regulation through eight regular-season contests versus the rival Hitmen and will now hope for a similar fate in the second round of the playoffs. 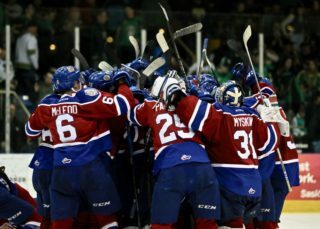 After ousting the Tigers in six games, the Oil Kings prepare to face a Hitmen squad that went the distance in the opening round versus the Hurricanes. 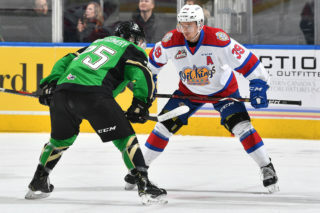 For the Oil Kings, leading the way is a pair of forwards in centre Vince Loschiavo and captain Trey Fix-Wolansky, both of whom wrapped up the first round with seven points. Between the pipes, the Oil Kings are also getting strong support from netminder Todd Scott, who won three of his four appearances in the first round while putting up a .895 save rate. Meanwhile, the Hitmen will turn to goaltender Jack McNaughton, who suffered a lone regulation loss through seven opening-round games. Leading the way offensively for the Hitmen is captain Mark Kastelic, as the Arizona native collected seven points in the first round, a total equalled by fellow forward Carson Focht, who also potted two game winners, as well as veteran defenceman Dakota Krebs, who recorded one goal and six assists. The Giants owned a top powerplay during the regular season, and continued to have success on the man advantage through the early goings of the playoffs as the team capitalized on seven of its 23 opportunities. Leading the charge was centre Jadon Joseph, who tallied four power-play markers and six total goals in the opening round versus Seattle. 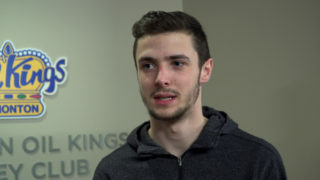 While Joseph led the team in the goal department, right-wing Davis Koch stood atop the team in scoring with 10 points, while defenceman and 2019 NHL Draft hopeful Bowen Byram provided eight points from the back end. But the trio is not the only offensive dynamos in the coming series, as the Royals offer up right-wing Dino Kambeitz, who put up five goals in six games versus the Blazers, while Denmark native Phillip Schultz recorded two goals and seven assists for nine points. Like much of the regular season, the opening round of the playoffs saw the Giants split its netminding duties between Trent Miner and Arizona Coyotes prospect David Tendeck, with each recording two wins in three games. The Chiefs could have their hands full in a second-round date with the Silvertips as evidenced by a season series that saw the club finish without a regulation win in eight contests. It could all come down to scoring, as Spokane boasts one of the WHL’s top offensive attacks, led by Riley Woods, who after pacing the team with 75 points during the regular season added another eight in the quarter-final, including four goals and four assists. Meanwhile, fellow forward Luke Toporowski matched Woods in the goal department, coming up with four tallies in the team’s five-game series versus Portland. 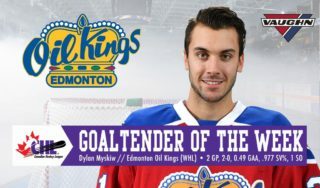 The two, however, will have their work cut out for them in facing Silvertips netminder Dustin Wolf, who after putting up seven shutouts during the regular season added another in five games versus the Americans, contributing to his impressive .937 save percentage in the series, tops among all WHL netminders. Meanwhile, leading the charge for the Silvertips is right-wing Bryce Kindopp, who finished with nine points in the opening round, second among all playoff scorers.